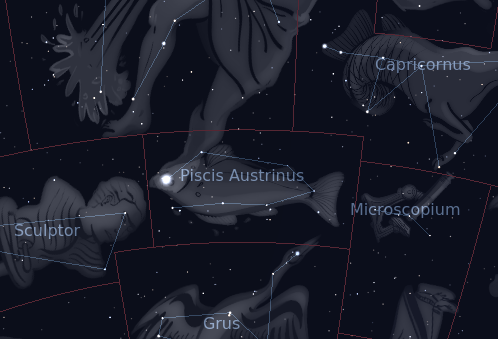 The constellation Piscis Austrinus. Roll mouse over to see labels. Piscis Austrinus is a southern constellation which lies just south of Aquarius and is highest in the evening sky in the months around August. Representing a fish, it is the southern counterpart of the faint northern fish, Pisces. It is rather easier to spot than the northern fish since its brightest star, Fomalhaut, has a magnitude of 1.2. Piscis Austrinus has no other prominent stars or deep sky objects, however. 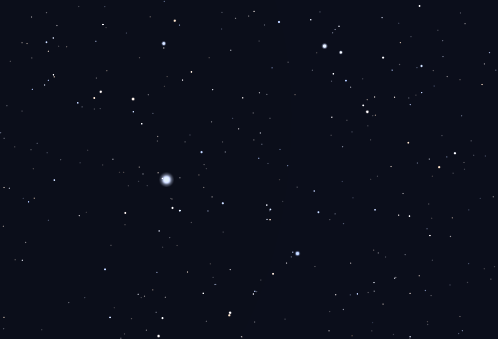 Its next brightest star, ε-PsA, is magnitude 4.2, and the only deep sky objects in this area of the sky are faint galaxies. According to various accounts, the southern fish may be the parent of the two northern fish. It may also have rescued the Syrian fertility goddess Derceto when she fell into a lake. Like the northern fish, Piscis Austrinus is almost certainly of Babylonian rather than Greek origin. The following constellations neighbor Piscis Austrinus: Aquarius, Capricornus, Grus, Microscopium, Sculptor.